In this lesson we’ll begin the exercise of applying strategic QoS models to a specific Place-in-the-Network (PIN). We will begin by exploring campus-specific design considerations and recommendations. Following this, we will detail platform-specific design recommendations for the access, distribution and core-layers of the campus network. This lesson features the Cisco Catalyst 2960, 3650, 3750, 4500 and 6500 series switches. Wireless is the medium of choice for connecting endpoints to the network, however since it’s a half-duplex shared medium, it’s also the most challenging medium for deploying QoS. This lesson introduces unique tools for achieving over-the-air QoS. We’ll also address QoS designs for both centralized wireless LAN controller deployment models as well as converged access deployment models. This section features the Cisco 5500 and 5760 series wireless LAN controllers, as well as the Cisco Catalyst 3850 series switch. This lesson expands the scope of discussion beyond the LAN and applies these strategic QoS principles to the wide-area network and presents QoS designs for both WAN aggregation routers and for branch routers. This lesson features the Cisco ASR 1000 and ISR G2 series routers. This lesson concludes our end-to-end QoS discussion by applying strategic QoS principles to IPsec VPNs. QoS designs are detailed for both Dynamic Multipoint VPNs (DMVPN) and Group Encrypted Transport VPNs (GET VPN). 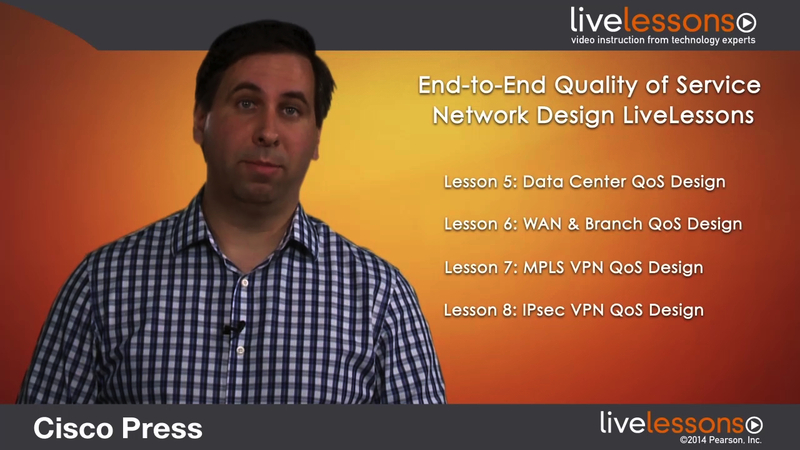 End-to-End Quality of Service Network Design LiveLessons: QoS for Rich-Media and Cloud Networks provides more than 9 hours of training detailing new and best practices, technical strategies, and proven designs for maximizing QoS in complex networks. This video course mirrors the author’s recently released book, End-to-End QoS Network Design, exploring various QoS designs for new applications and technologies, industry standards and platforms (with more than 10 different Cisco product families being represented throughout). Tim Szigeti supplies design recommendations and enables the viewer to confidently and successfully design and deploy QoS across their Cisco networks. Tim Szigeti, CCIE#9794, is a senior technical leader in the System Design Unit at Cisco Systems. He designs network architectures for the next wave of rich media applications, including TelePresence, IP video surveillance, digital media systems and desktop video. For more than a decade Tim has also specializes in Quality of Service technologies and has authored many technical papers, as well as the Cisco Press Books: End-to-End QoS Network Design and Cisco TelePresence Fundamentals. IT technical staff tasked with deploying Quality of Service technologies. These may include network administrators, systems administrators, audio/video specialists, VoIP specialists, and operations staff. Technical decision makers tasked with evaluating the technical feasibility of Quality of Service deployments, as well the drafting of deployment plans and phases. Cisco System Engineers, partners, trainers and other networking professionals who need to ramp-up technically on QoS technologies and designs, both for practical deployment purposes, as well as to achieve various Cisco certifications. Pre-requisites are minimal, as the opening section of the course covers QoS technologies in high-to-mid-level technical detail, including protocols, tools and relevant standards. Since the content of the course ranges from high/mid-level technical detail, to a very low-level of technical detail, it is suitable for a range of audiences, from intermediate to expert. This lesson provides an introduction to the most common QoS tools and explains the relationahips between them. Coverage includes discussion of Cisco’s Modular QoS Command Line Interface (MQC), the syntax structure for configuring QoS across most Cisco platforms. This lesson begins with applying strategic QoS models to a specific Place-in-the-Network (PIN). We will start by exploring campus-specific design considerations and recommendations. Following this, we will detail platform-specific design recommendations for the access, distribution and core-layers of the campus network. This lesson features the Cisco Catalyst 2960, 3650, 3750, 4500 and 6500 series switches. Wireless is the medium of choice for connecting endpoints to the network, however since it’s a half-duplex shared medium, it’s also the most challenging medium for deploying QoS. This lesson introduces unique tools for achieving over-the-air QoS. We will also address QoS designs for both centralized wireless LAN controller deployment models as well as converged access deployment models. This section features the Cisco 5500 and 5760 series wireless LAN controllers, as well as the Cisco Catalyst 3850 series switch. Trends in computer, storage, and network virtualizationcloud computingallow IT administrators greater flexibility, efficiency and economy than ever before. However, cloud computing requires lossless services for certain protocolswhich is beyond the capability of traditional QoS tools to guarantee. This lesson considers unique new data center QoS tools to address these requirements, as well as detailed design recommendations for the data center access, aggregation and core layers. This lesson features the Cisco Nexus 1000V, 5500/2000 and 7000 series switches. This lesson expands the scope of discussion beyond the LAN and applies strategic QoS principles to the wide-area network and presents QoS designs for both WAN aggregation routers and for branch routers. This lesson features the Cisco ASR 1000 and ISR G2 series routers. This lesson concludes the end-to-end QoS discussion by applying strategic QoS principles to IPsec VPNs. QoS designs are detailed for both Dynamic Multipoint VPNs (DMVPN) and Group Encrypted Transport VPNs (GET VPN).